This came to us by way of SHF Cub Reporter, Baby Dave Rochlen and comes from the Croul Publications facebook page. 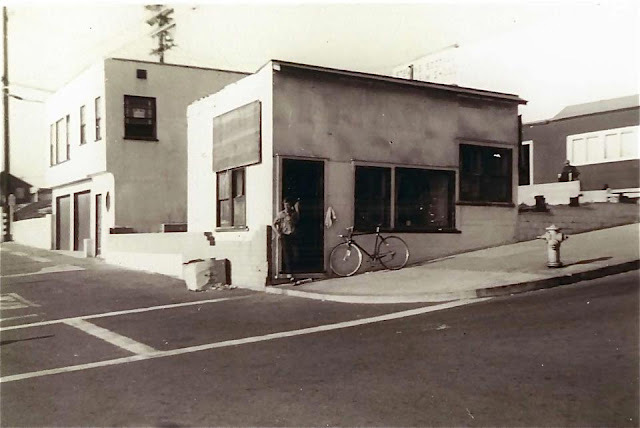 Here’s a little piece of history: a photo of Dale Velzy’s first shop in Manhattan Beach, and the only such picture known to exist. When our book “Dale Velzy is Hawk” was being produced it was an endless source of frustration to us that we were unable to find a photo of this location. Velzy opened the shop, a former shoe repair just a stone’s throw from the Pier, after he’d been booted off the beach for littering the sand with his balsa wood shavings. It was the world’s first commercial custom-built surfboard shop, and according to Velzy himself, it was there that he was issued California’s first State Board of Equalization resale (sales tax) number in the category of surfboards. For the record, we get lots of correspondence regarding Velzy having a shop before Hobie, but Hobie was the first to construct a building specifically for the manufacturing and sale of surfboards. Pacific System Homes, LA Ladder, Rogers, etc. all manufactured boards as supplemental income and Simmons, Quigg and Kivlin worked out an existing building in the Santa Monica/Venice area. Velzy author Paul Holmes informed us that this building pictured here was originally a shoe repair shop that Dale converted into his surf shop. Wow Dale Velzy's book is the greatest...If you want to know all about the surf history this is a must...!